These Sweet Blueberry Pecan Squares have a sweet, creamy filling layer, graham cracker crust and delicious pecan topping. Simple to make, these Sweet Blueberry Pecan Squares are a perfect colorful, and delicious, dessert for any occasion. • Lightly spray a 9″x9″x2″ baking pan with non stick spray. • Combine graham cracker crumbs and melted butter together in a bowl; press mixture firmly into the bottom of your pan. • In a separate bowl, combine by hand your sweetened condensed milk and lemon juice, add sour cream and mix well. • Spread sour cream mixture evenly over the top of the graham crackers in the pan. 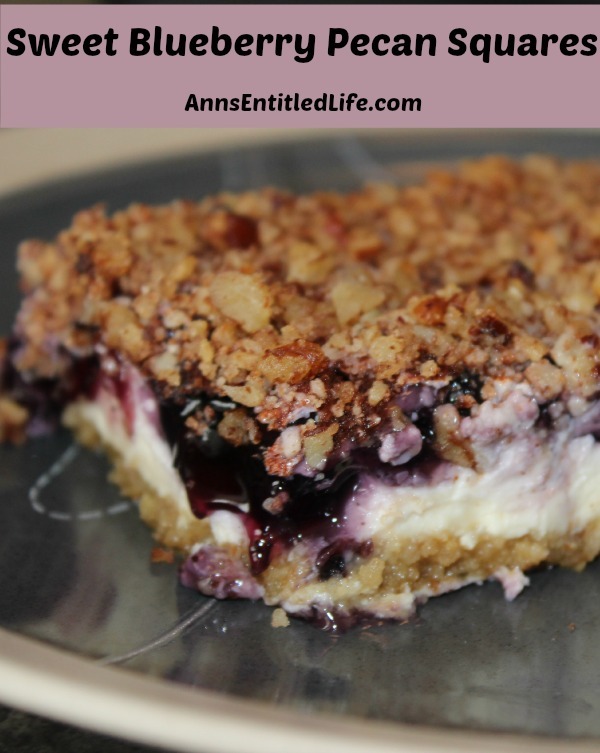 • Top the sour cream mixture with the blueberry pie filling, spreading to the ends of your pan. • Sprinkle pecans over the pie filling. • Sprinkle ground cinnamon on top of the pecans. • Bake in preheated 400° oven 20-22 minutes, or until you see the sides lightly brown. • Store leftovers in the refrigerator. Note If you want to substitute apple pie filling for blueberry, that works. If you go the apple pie filling route, swap the pecans for walnuts, and add 3/4 of brown sugar to the topping. Most excellent! 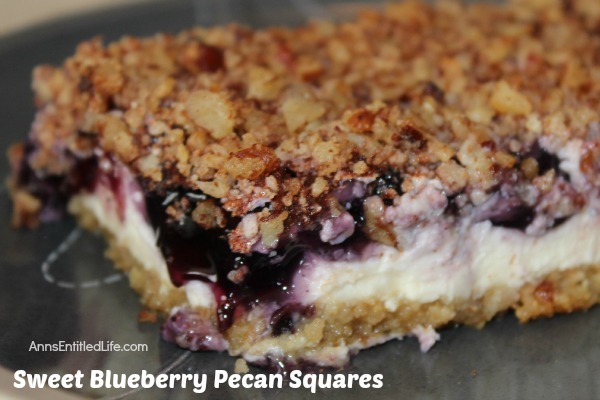 • To print the Sweet Blueberry Pecan Squares recipe, click here. • For instructions on How To Chop Nuts Easily (seriously 2 minutes for a full bag of shelled nuts), click here. Finally! I creamy recipe that does not have Cool Whip as an ingredient! I’m ching to have to try this for sure! Thank you! I hope you enjoy it, Rachel! We really do. Can you use fresh/frozen blueberries for this recipe? I would not, Julie. If you do, you’d have to boil them down to make a sauce, add more blueberries, add a starch, and try and replicate canned blueberry pie filling. This looks so good. I am pinning this and going to make it. O m goodness! This looks so good, love blueberry desserts. Pinning for later! Thanks for sharing, visiting form Foodie Friends Friday. do you think you can use strawberry or apple pie filling instead of blueberry? Strawberry pie filling would probably work, Charity. Same with raspberry. The apples — possibly. I have never used any of those though, so I am just assuming based on consistency. If you try it, could you report back how it turned out for you?